As I hunker down and wait for the snow to begin to swirl, I am reminded of both the beauty and the power of God as expressed in nature. Whenever I think too much of myself and I need to be humbled, I need simply to stand at the edge of the ocean, or stare up into the night sky, or even look out the window at the falling snow. I read yesterday that scientists now believe there is a new 9th planet out beyond Pluto. (I still haven’t quite made peace with the fact that they don’t call Pluto a planet anymore). They haven’t found it yet, but they think it is there. When I realize that we don’t know the extent of our own solar system, or even what lurks at the bottom of our own oceans, I am reminded how arrogant we have become as humans. We think we don’t need God because we have it all figured out. Funny, that’s the same self-absorbed thinking that got Adam and Eve in trouble in the Garden. We humans are slow learners. I write all this because I believe God wants us to live with a sense of awe, both about the creative beauty He expresses in nature, and of our smallness in its midst. A butterfly’s wing or a flower petal help us appreciate the former. A good snowstorm the latter. This past weekend my two brothers and I had our annual “Brothers Weekend” outing where we get together for a weekend of one adventure or another. This year we went kayaking in the Florida Everglades. The Everglades are a breathtakingly beautiful ecosystem. However, one is also quickly reminded that this is territory that was not built for humans. We were truly guests in this strange land. 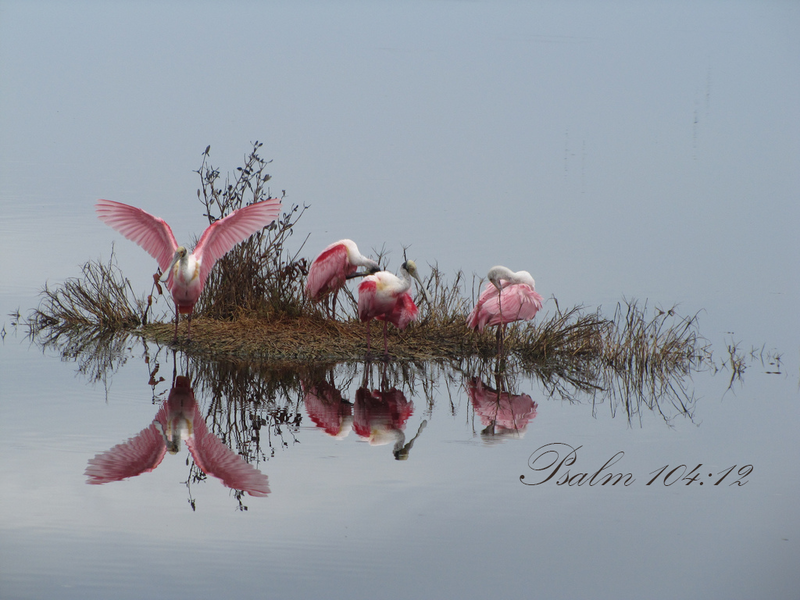 Watching roseate spoonbills take flight or dolphins frolicking in the river, or a raccoon fishing for crabs on the mangrove shores elicited that awe and wonder I described above. So also did the two-foot storm surge from a violent storm that flooded our back-country campsite in the early hours of the morning. It is wise to remember that we are guests here in God’s world. This is His creation, not ours. We cannot control it, nor can we tame it. But we can let it point us to God, and I believe that is His desire. Today, as you sit by the fire or look out the window at the falling snow, pull out your Bible and take a few moments to read Psalm 104. Roseate Spoonbill photo by US Fish and Wildlife Service. Used under creative commons license from www.flickr.com.